Survival horror is quickly running out of places to go. The genre feels as though it has matured to the point where not a lot of innovation is going on. At least, until we heard about Cursed Mountain. Last month, I previewed it and was pretty excited: the premise behind it, moving survival horror controls to the Wii to make for a more intimate experience, sounded good. Needless to say, I was pumped to rip into this one. Rescuing my brother from the undead in the Himalayas? Grab the climbing gear and magical pickaxe, and I'm more than ready to go. Set in the 1980s, a lot of the modern conveniences like cellphones and GPS devices aren't around, so it's all up to climbing instinct. 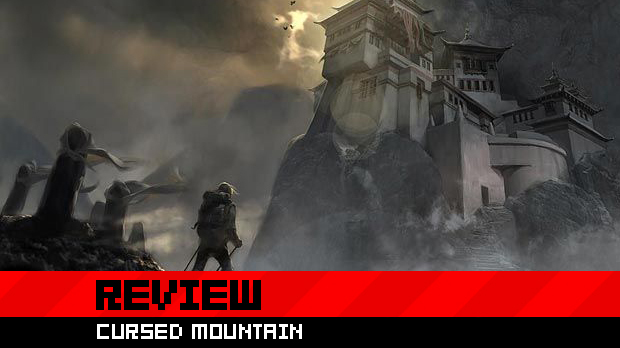 Cursed Mountain is taking a stab in a very different direction, so there's a lot of new ground to tread. Do they climb up to the top of the pile in the genre, or do they lose their footing along the way and fall short? There's only one way to find out: check out the full review after the jump! Your brother, Frank Simmons, has gotten himself stuck up on the top of the famed mountain Chomolonzo up in the Himalayas, and it's up to you to rescue him. It doesn't seem so bad, does it? When you get to the town at the base of the mountain, things are already amiss. As you would expect from most any horror title, the town is deserted. But screw that, you've got to soldier on ahead in order to rescue him! The reason why the town is deserted? Because spirits from the Bardo -- the realm between this life and the next -- have gotten pissy and started attacking people left and right. Thankfully, you've picked up your brother's ice axe that just so happens to have magical ghost-fighting abilities. 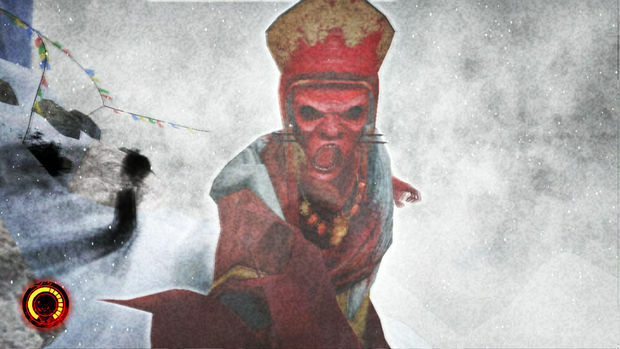 As you ascend the mountain and fight your way through wave after wave of spirits, the main mystery is figuring out just what happened that brought about all these ghosts, and unraveling the mysteries of the Buddhist and Tibetian lore that surrounds the culture that you're in. The game was pitched to me as one with a very strong story, and that was the focus around which the rest of the game was built. Of course, it's also the game's biggest flaw. 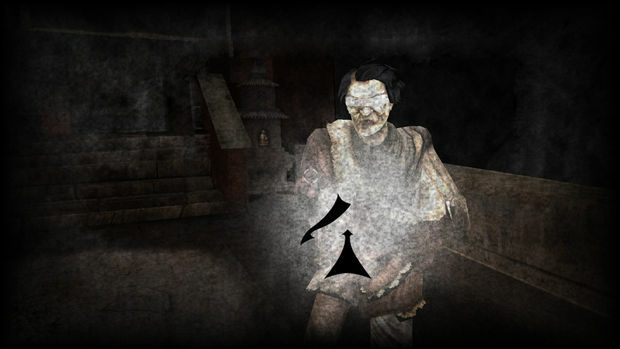 The game starts off unbelievably creepy, to the point that it reminded me of Silent Hill 2. Running through the opening town, ducking down tight alleys, and walking into rooms that were dank and filled with the smell of rotting meat and bodies, it actually built up a level of anxiety for me. I just wanted to get out of there, fast. After running into a monk who explains the basics of "seeing into the Bardo" using my third eye, it's time to climb the mountain and rescue Frank. The ghosts are kind enough to announce themselves with a fairly loud roar and a puff of smoke as they shamble towards you. There are essentially two ways of attacking the enemies: either by bludgeoning them into the next world with your pickaxe, or by attaching a talisman to the pickaxe and firing spiritual energy at these things. Once you've nearly killed them, you can banish their souls to the next world by performing a randomized set of movements with the wiimote and nunchuk that are supposed to mimic Buddhist rites. The whole idea behind this sort of combat, and why this game is made for the Wii, is that it opens the body up and makes you more vulnerable. So, in the first few levels, my reactions to enemies appearing were often frantic flailings hoping while I hoped to God that these things would just die already. When I managed to banish one, it was a great sigh of relief. The tension was there, as I'd continue to make my way through the foothills of the mountain and towards my brother's rescue, when I finally came across one of the big bosses of the game: a raven-like beastman that seemed to be plucked from Gurren Lagann. The battle wasn't easy, and I know many a people got stuck in this battle time and time again and weren't able to complete it until they played through the fight a dozen times. Whether it took one or ten tries, this marked a changing point in the mood of the game. It was no longer scary. The entirety of the middle act of the game was just a mix of combat, darkness, and climbing. It became a light-hearted adventure for me when I picked up another type of spirit attack for the pickaxe. 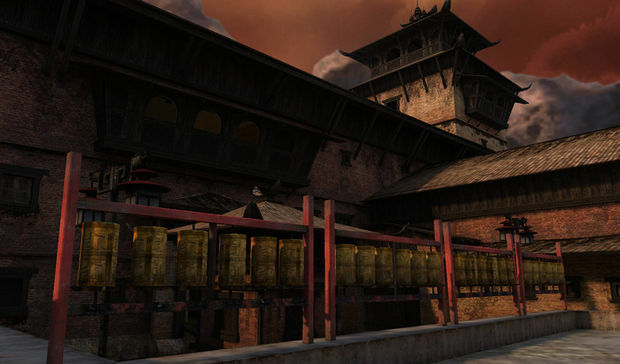 Up to this point, I had been using either a standard bullet-shot or a strong piercing lance attack, but finally I picked up a beam that would allow me to latch onto ghosts and one-shot kill them if I performed the Buddhist rites. In essence, I was now a Ghostbuster. It's silly that this killed it for me, but it comes to the shortcoming of the story. Up through the first act, I was legitimately scared of what was going on -- I feared for my life in combat, worried that I wouldn't make it to the next battle. 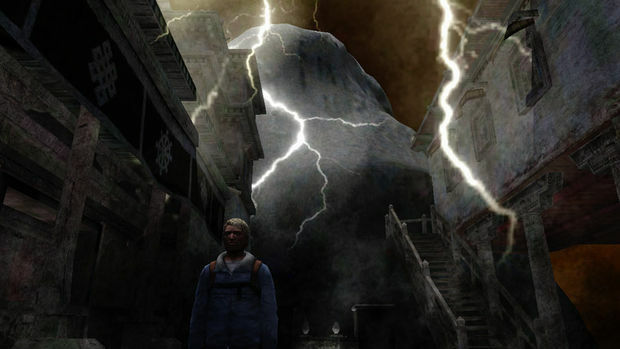 After that one boss fight, the game became more about exploring the mountain and trying to get to the top than keeping up the suspense and terror aspect. The game managed to pick it up again in the third act, where the closer you got to the summit, the more frantic and powerful the battles became. It's a problem I've run into time and time again when writing stories: there's a great hook, and I'm really digging the story, and the resolution works fairly well, but I don't quite know how to carry things from Point A to Point B and still keep things interesting. There were a few flaws that detracted from play, making the second act particularly annoying. One of the consistent problems that I ran into was the relative inaccuracies in picking up my movements with the Wiimote. A majority of the time, you'll be required to slash downwards to the left or right, or push forward. The Wiimote didn't always agree with me, leading to some frustrating deaths. While the graphics weren't bad, the game was overly dark. As in I had to crank the contrast up way too high in order to see doors hidden in the shadows or just about any of the textures in the game. The game's cutscenes reminded me of those from Red Steel: still images that glided across the screen in lieu of something directly animated. It added to the other-worldy feel of the game. By the time I was done with Cursed Mountain, I felt that I did enjoy the game. The ending was satisfying, I had a good rush in my last couple of play sessions, and I could tell they really tried something new. But on the other hand, they weren't able to follow through on the tension of the horror aspect of the game and keep your heart pumping, which was a pretty big failure, in my mind. I have to give credit to the guys at Deep Silver for trying something new, especially in a genre like horror, which needs new blood in it. They've got their heads in the right place, and the start of something that could be really good, but they've still got a long way to go in the ways of storytelling, pacing and visuals before this gets up into the pantheon of must-play horror games.